A retired US major general thinks an American intervention in Ukraine should involve the spilling of Russian blood. Robert Scales, a retired US major general and a Fox News military analyst, provided his view on the US involvement in Ukraine, describing it as a “game, set and match” situation; “the only way the US can have any effect in the region is to start killing Russians,” he stated. Maj. Gen. Robert Scales had been invited to the Lou Dobbs Tonight program on Tuesday to comment mostly on the fight of Iraqi forces against Islamic State near the city of Tikrit. 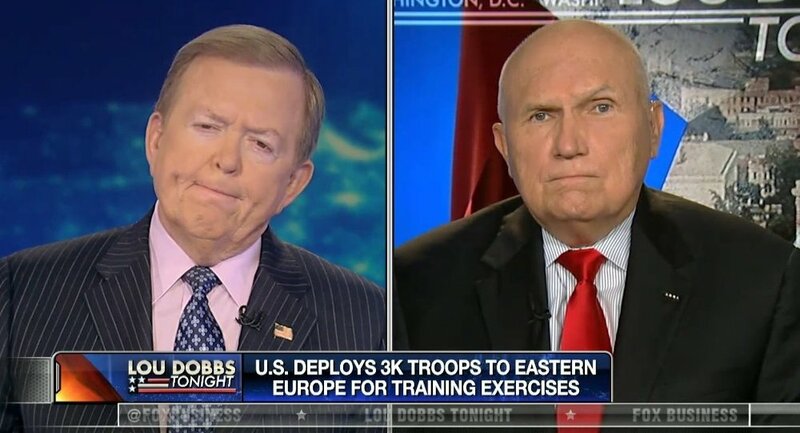 The host, however, wanted more insight into the US involvement in the world and asked the retired major general to comment on the recent US announcement that it would send 3,000 troops to Eastern Europe – to what effect, he wondered. The answer came as rather surprising to Lou Dobbs. That is all the strategy of “leading from behind” is up to. The Russian bit starts at 03:17.